What is the hottest green energy? Coming from deep within the earth’s core, geothermal power has been used for cooking, bathing and keeping warm since Roman times. Today, it is a promising clean energy option, and there are many who hope it can further lessen the use of fossil fuels in the near future. Geothermal resources have been identified in over 80 countries and approximately 70 of those are making direct use of this energy. In Iceland, 90% of space heating is geothermal: most cities, like Reykjavík and Akureyri, use networks of piped hot water to heat buildings in whole communities and even below outdoor pavement to melt snow on sidewalks. In 24 countries around the world, electricity is produced from geothermal power. Five of those countries get 10-22% of their electricity from geothermal sources. Output is growing by 3% annually, as more plants are built and capacity improved. Here at the United Nations University Geothermal Training Programme (UNU-GTP — a partnership with Orkustofnun, Iceland’s National Energy Authority), we aim to boost the world’s geothermal usage even further. The UNU-GTP assists developing countries by training specialists in geothermal exploration and development. The 30-year-old programme offers six months of specialised training (tailored to each country’s context) with the possibility of extension to a Master of Science degree in geothermal sciences or engineering. Geothermal energy is constant and independent of weather conditions — unlike wind, solar and hydro. Its source is about 6,000 km underground, at the earth’s core where the slow decay of radioactive elements — a process that happens in all rocks — produces continuous temperatures hotter than the sun’s surface. The Earth’s crust is divided into 14 plates that move in different directions at different speeds. Plate boundaries are characterised by faulting, earthquakes and volcanic activity. Geothermal fields, or areas, are common on plate boundaries with volcanic activity — for example, along the Ring of Fire. In a simplified model of a traditional geothermal system, rainwater that has seeped into the ground along fractures in the rocks collects in a natural underground reservoir near a heat source at depth (such as a magma chamber). The water becomes heated, its density is lowered, and it then moves towards the surface through other fractures. 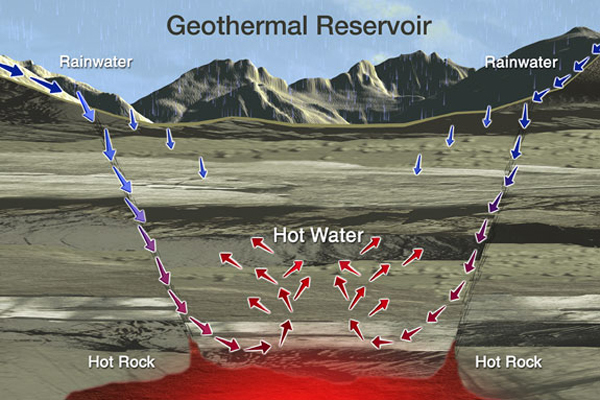 Water for geothermal utilisation is extracted through drill holes that intersect these hot water flowpaths. This geothermal exploitation typically takes place at depths down to a maximum of about 3,000 metres from the earth’s surface. Courtesy of the Geothermal Education Office. 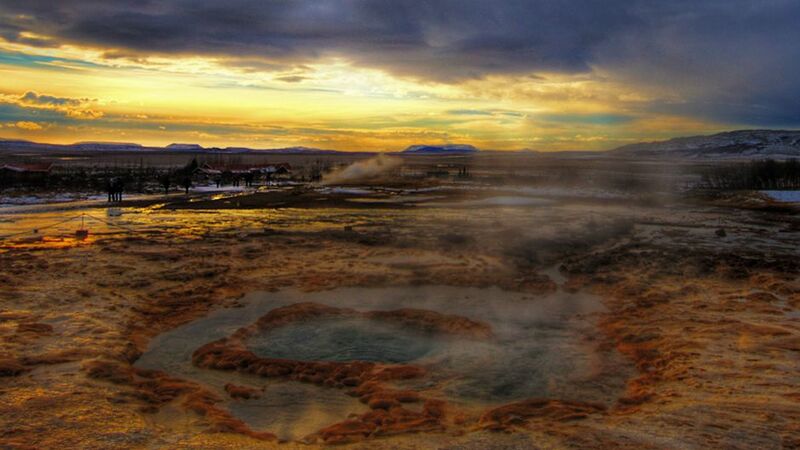 There are two types of geothermal resources: those 150°C or hotter that are found in connection with volcanic activity; and low-temperature resources of 150°C or less that are found in places like sedimentary basins or extinct volcanic areas. Energy from high-temperature resources is used for electric power generation, while low-temperature resources are used for direct purposes, such at space heating, space cooling, bathing, fish breeding and production of vegetables in greenhouses. Flash steam plants that use hot water that is pressurized to convert it to steam, which drives the generator turbines. When the steam cools, the excess water is re-injected into the supply reservoir or used directly, e.g., in space heating. Most geothermal power plants are flash plants. In some cases, however, low temperature resources can be utilised to create power in binary power plants where heat is transferred from geothermal water to a fluid with a lower boiling point, e.g. ammonia. The heat causes the fluid to turn to steam that drives the turbine. Another type of geothermal energy, created by ground source heat pumps, has the potential to grow worldwide since it exploits the temperature of the ground rather than needing a true geothermal source. While temperatures above ground vary from day to day, temperatures in the upper ground are near constant. The soil is warmer than the air in winter and cooler than the air in summer, so these pumps transfer heat from the ground into buildings in winter and the reverse in summer. Geothermal fluids contain variable amounts of gases, mostly nitrogen, carbon dioxide and hydrogen sulphide, depending on the location of the geothermal field. However, most chemicals are concentrated in the return water that is commonly re-injected into the geothermal reservoir where it is heated anew and re-utilised. The CO2 emissions from electricity produced with high-temperature resources are approximately 10 times less than those from fossil fuels. Those emitted from low-temperature resources used for direct purposes are just a fraction of those from high-temperature fields. In Reykjavik, the CO2 content in low-temperature resources is lower than that of cold groundwater. Ground source heat pumps also offer much potential for reduction of CO2 emissions. Furthermore, if the electricity that drives the pump is produced from a renewable energy source like hydro or geothermal, CO2 emissions will be zero. With the level of CO2 in the atmosphere continuing to increase, we need to encourage actions that will stabilise levels at below 350 parts per million and therefore lessen the climate change dangers ahead. The development of geothermal resources worldwide is a way to limit the environmental impact of power production. In Reykjavik, geothermal plays an important role in climate change mitigation. CO2 emissions have been cut by replacing coal and oil for geothermal space heating and Reykjavik is now one of the cleanest capitals in the world. Thankfully there are developing countries like China (currently the country with the highest direct use of geothermal resources) and Kenya that are interested in emulating Iceland. Further, research worldwide continues and “enhanced geothermal systems”, that are still in the early stages of development, may offer enormous new potential, according to experts (PDF). Using such new technology to extract stored thermal energy from “dry hot rock” and magma would mean geothermal power could be tapped from places that do not hold underground pockets of steam or heated water. Surely something as clean and as hot as geothermal is worth harnessing? How Things Work: Geothermal Energy by Dorthe H. Holm is licensed under a Creative Commons Attribution-NonCommercial-ShareAlike 3.0 Unported License. Dorthe H. Holm is a geologist/editor working for the United Nations University Geothermal Training Programme as one of four permanent employees. She graduated with a Master of Science in geology from the University of Aarhus Denmark in 2003 before pursuing a fellowship at the Volcanological Institute in Reykjavík, Iceland. How far are we from having the technology to both generate and transmit geothermal energy, so that it can really be a substantial base load energy provider? So informative topic, hopefully the geothermal energy is really the replacement of all the artificial energy we have today and be use in the near future to lessen the problem for our nature. You are a good writer; you really have a good topic.